"Hey Gajeel!" A voice called to me from down the hall. I turned to see a man in dark red armor and salmon pink hair run towards me. "Natsu! I was wondering where your ugly mug was!" "Oi!" he yelled, punching me in the arm. I rubbed my arm as he laughed. He threw his arm around my shoulder,"So what were you doing in the garden last night?" He suddenly asked. "I don&apos;t know what your talking about." My face felt slightly warm. "Oh come on man! With Le-" I slapped a hand over his mouth. He grinned. I groaned," So what?" "So what? Your not trying to get close to a doll are you?" He asked. I wanted to punch that stupid face of his. "She isn&apos;t a doll." Another of his stupid grins. "I wouldn&apos;t bother getting close to her." he said as he walked forward. "Why not?" I followed him." A number of reasons really. Two important ones. One, you and Grey are working pretty quick around here. Before long everyone will be fixed and you&apos;ll leave, never to see her again." "I think you&apos;ve been reading to many of Lucys books..."i grumbled. He frowned at me but went on. "The second reason, do you know why Siegrain brought her here in the first place?" I shrugged. "Originally she was going to be his bride." I stopped in my tracks, and I felt my heart give a painful tightened. "Is that right?" He nodded. "But she turned him down. Every year at the festivals masquerade ball he asks and she denies" That made me feel a little better. It was one week until the ball. "Well I just have to make sure he doesn&apos;t find out." I grinned at Natsu making him laugh. "And how about when you finally finish your work?" I frowned. Natsu suddenly grinned mischievously. "What?" I raised an eyebrow. "What if there wasn&apos;t a shortage in damage?" He grinned. "Eh?" I was confused. "I&apos;m saying what if they keep getting broke? Maybe a good buddy helps by causing damage?" I looked at him. "You mean your gonna break them?" "Just cause accidents." I grinned wickedly. If it meant getting to stay by Levy even for a little while longer I didn&apos;t care. "Your a devil." We both laughed as we walked down the hall. After breakfast Grey and I got started on our next round of repairs. I was working on a mans leg when Juvia approached Grey. He had just finished working on someone. "Um, excuse Juvia. Grey-sama may Juvia have some assistance? Juvia hates to be a bother. "she held her hand out to him, it was no longer attached to her arm. "Juvias hand has fallen off." "Are... Are these saw marks?" Grey asked. "Juvia was trimming the trees..." "Don&apos;t they have gardeners for that?" "Juvia was helping..." I thought I was gonna die. Juvia seriously cut off her hand just so she could be by Grey. Juvia shot a glare at me as Grey focused on reattaching her hand. I chuckled to myself as I turned back to my work. They day flew by and after dinner I made my way outside. The Sakura tree wasn&apos;t glowing but Levy was once again sitting with her eyes closed. "No rainbow tonight?" she shook her head. "Only on full moons." she smiled up at me. "So what shall we do tonight? "She asked. "Whatever you want." I said. She smiled. "I don&apos;t mind sitting like this for awhile." I nodded and leaned my head back while closing my eyes. 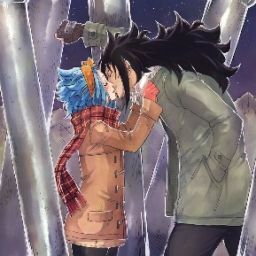 I must have fallen asleep because I woke up to Levy gently shaking me. "Wake up Gajeel." "Mmph." I groaned and stretched. She giggled. "You look so cute when you sleep." I felt my face heat up. "Tch whatever." It was starting to get light outside. "I slept all night?" She nodded. "Sorry." I mumbled. She shook her head. "Don&apos;t be. It was very relaxing just to sit by you all night." I smiled a little at her. We stood up and separated once in the doors. Another days work. I decided to have breakfast in the main hall with Grey and Siegrain. I sat next to Grey and started in on my food. "So nice for you to join us Gajeel." Siegrain said quietly. I just nodded at him. After a little bit I looked to him. "Your majesty I have some errands to run today. I was hoping I could borrow someone so I could leave Grey here." He nodded."Certainly. But are you sure Mr.Fullbuster will be alright alone?" Grey looked pissed but I kicked him under the table. "He has improved greatly in the week we have been here. "I don&apos;t know what Natsu was doing to keep breaking the puppets but it was working. "And Juvia can help him. She has seen me work before and I know between the two of them things will go swimmingly." I saw Juvia on the other side of the room looking ready to burst. Siegrain nodded. "Who would you like to take with you?" "Levy." He was quiet for a moment while eyeing me. I didn&apos;t budge. "Very well. How long will your errands take?" "Probably all day. I will put extra work in tomorrow to make up." Siegrain nodded as he called for Levy. When she entered he explained she would be going with me. Once I finished eating I stood and Levy joined me. "So what are your errands?" she asked. I grinned as we exited the castle gates. "To give you the best birthday ever."